I’ve been meaning to tell you about this cookbook for awhile. 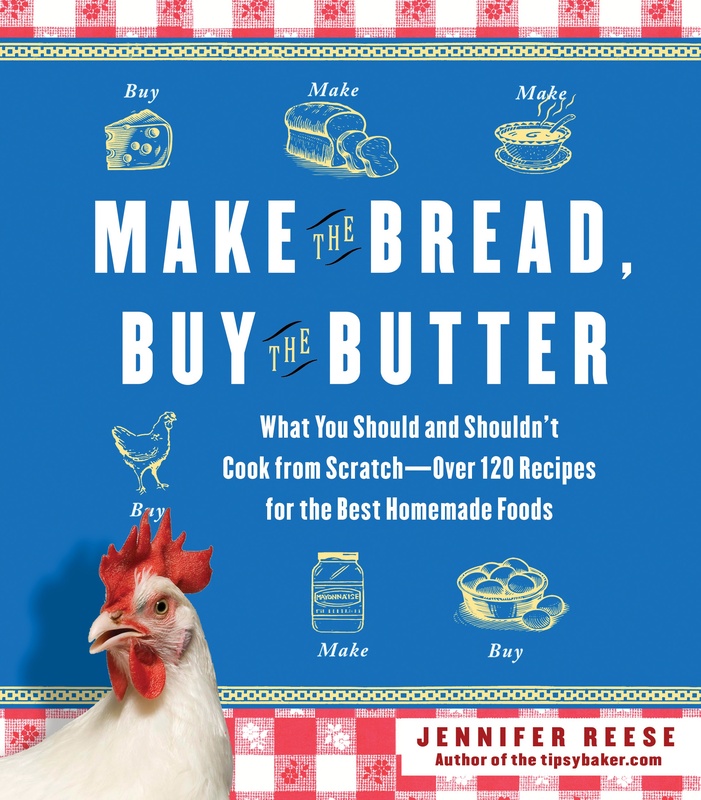 For all those of you out there who are raising chickens, pickling, and making your own crackers, you’ll find good wit and wisdom in “Make the Bread, Buy the Butter” by Jennifer Reese (Free Press, October 2011, $24). Having chickens cluck in the yard and filling your pantry with preserves that you picked and canned yourself is rewarding – but is it worth all the time battling persistent bugs and rodents just to say, “I made this sauce with heirloom tomatoes I grew myself”? Reese, who blogs at www.tipsybaker.com, took on an ambitious project when she applied her journalistic skills to figure out what is worth making at home (croutons), what is worth attempting for the experience (Camembert cheese), and what is an accomplishment but a true pain in the rear (prosciutto). While tackling more than 120 recipes for everyday items made from scratch Reese does us all a big favor. She puts in the time to discover how much of a cost savings and a challenge it is to make your own Oreos, so we don’t have to. Reese also wisely counsels that sometimes picking up a rotisserie chicken is just as delicious as roasting your own, plus you’ll get a few more precious moments to put together a puzzle with your child and eating before 8 p.m. instead of dashing around and trying to recreate a dinner scene from a Norman Rockwell painting. We decided we couldn’t let our chickens range around the yard anymore. Although the yard was secured by a tall wire fence, the sight of all those chickens drove the local predator population mad with bloodlust. I disapprove of factory farms, but I understand why people who depend on chickens for their livelihood might decide to keep them in a big, windowless room…. The chickens resented the coop. They paced their perimeter, yelling, looking out through the chicken wire. I liked them less almost immediately. I found them irritating with all their complaints and demands, and somewhat contemptible. I had an inkling of how becoming a prison guard might corrode the soul. The tale of the chickens, of course, doesn’t end there, and in the end Reese admits that her feathered “girls” are really more like an expensive hobby that provides her family with fresh eggs and hours of entertainment than a backyard sustainable food source. I was thrilled to find a yogurt recipe in “Make the Bread, Buy the Butter” that doesn’t involve a yogurtmaker because I keep hearing how easy it is to make your own yogurt and how much money you save making it yourself instead of shelling out $6-$7 for a large carton at the grocery store. I did try Reese’s recipe, with no luck. For the record, I am a failure of a yogurtmaker and I seem destined to put this easy process into my “buy it” category. I’ve tried other homemade yogurt recipes to only end up with slightly curdled milk. I guess I just have to accept that I am one of those overly scheduled urbanites whose fantasies of homesteading will have to be lived vicariously through others like Reese, or my friend Enicia. I just don’ t have the time to babysit warm milk as it transforms into thick, creamy yogurt. All in all, “Make the Bread, Buy the Butter” is a very useful and valuable collection of recipes ranging from the complex such as croissants to classic favorites such as pumpkin chocolate chip muffins to easy sauces such as mayonnaise. Like most food memoirs, readers also get a peek into Reese’s family life stirred with vignettes from her card-file of memories. That alone makes Reese’s book worth reading – even if you really, really don’t have the time to make the bread. Kudos to Reese and you for covering this topic! I’m glad to learn I’m not the only one frustrated by my attempts to make my own yogurt, but I’m also proud of my huge bottle of home-made vanilla extract. I’m excited to glean from Reese’s wisdom as I experiment with crazy notions of making my own mayo, shampoo, bagels, etc. Yup, this is a good one. I got Jordan this book for Christmas after hearing a great interview with the author on NPR. Sounds very sane! And reminds me of my cheese making phase. I gave up when I realized that it was a whole lot of frustrating work to make a substandard ball of mozzarella.